(MONEY Magazine) -- Great careers in investing often end in tears. A fund manager may run up a string of winning years and then blow it all on one bold bet. 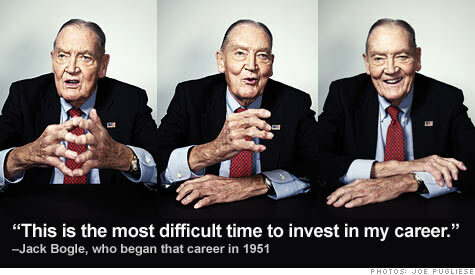 In 1975, Jack Bogle made his own risky move, launching the fund known today as Vanguard 500. The premise was simple but radical: Instead of chasing returns in the latest hot sector -- or trying to pick the unloved stocks that the market will embrace tomorrow -- just buy every blue-chip stock on the market and pay as little as possible to the middlemen. Vanguard, which is owned by its funds' shareholders, in 2010 became the largest mutual fund manager in the country. And the firm's flagship indexers -- 500 and Total Stock -- have both outperformed more than 60% of their peers over 15 years. Even as indexing has triumphed, Bogle says, Wall Street has become more hazardous for individuals trying to build their wealth and save for retirement. "This is the most difficult time to invest in my career," he tells MONEY senior editor Walter Updegrave. An edited version of their conversation follows. Why do you say that this is the most difficult time to invest in your entire career? Well, just look at the dividend yields stocks are offering. We almost don't talk about yields in equities anymore, but yields are a pretty firm anchor for returns. I remember in 1974 writing an annual report saying you really can't go wrong when stocks are yielding 6.5%. Unbelievable! It's a bad period for this philosophy. In 2008 we had one of the largest cuts in dividends in the history of the S&P 500. Now the dividends don't seem to be coming back, even though the earnings have. What are the corporations trying to tell us? I don't know. Maybe they're trying to tell you that these earnings are phony, and we don't have money to pay you dividends. Corporations play games with earnings. I just don't believe them. Operating earnings are always higher than reported earnings after write-offs, because corporations are always making investment decisions that are bad. They always have write-offs and tell us they're "nonrecurring." Except they recur year after year after year. So what does today's average dividend yield of 2% or so say about future returns? That's if things don't fall totally apart, and I don't think there's any predicting that. I think there's at least a 1-in-15 chance that we'll face even more serious economic problems. That's the biggest problem today: There's nowhere to hide. Bond yields at roughly 3% are so poor it's hard to believe. I wouldn't call it a bubble, though, because if you hold for 10 years you will get that 3%. First, don't reach for more than the market return. You could try leverage, or buying commodities and gold. And maybe you'll do well -- but who really knows? Those alternative investments have no internal return. They are 100% speculation. You are speculating you can sell to someone for more than you paid. They're like stocks that pay you no dividends and offer no earnings growth. The second thing is to try to give the lowest possible share of what you are going to earn to Wall Street. And that of course means going with the lowest cost. Those would be index funds. Critics of indexing point to the past decade, when stock index funds like Vanguard 500 have barely broken even. Why would I buy a fund that goes down right along with the market? That's what all mutual funds do. When the S&P went down 37% in the crash, the average equity fund was down 39%, the average international fund was down 45%, and the average emerging-market fund was down 54%. If you don't want funds that fall with the market, why would you buy any of them? Index investing assumes markets are rational and "efficient" -- meaning prices reflect everything the market knows. But hasn't the financial crisis taught us that markets can act irrationally? You don't need the efficient-market theory to justify indexing. Indexing wins whether markets are efficient or inefficient. In an inefficient market, a good manager may be able to win by five percentage points a year over a decade. But by definition, a bad manager must lose by the same amount. It all has to average out. So even if the market is very inefficient, the index will still capture your share of the market return. So I don't rely on the efficient-markets hypothesis. I go by the "cost matters" hypothesis: Whatever the market returns, on average you will beat your rivals if you lower your costs. And that's what index funds do. I know I can sound like a Johnny One Note on this, but somebody, please tell me that I'm wrong. But cost matters only if I'm getting the average return. What about the investors who can do better? Well, if you're not indexing, you've got problems. First, a stock selection problem -- maybe you'll pick good stocks, maybe you won't. Then a market sector problem -- will growth do better than value? Finally a manager selection problem, which is the worst because the only way people have found to pick good managers is to look at past performance. That's not a reliable gauge. Indexing has become even more popular lately thanks to exchange-traded funds. Good thing? There's no denying ETFs are one of the great marketing ideas of this decade. The question is whether they're a good investment idea. They give you the ability to trade all day long in real time. But if you want to trade anything frequently -- all the market sectors, different countries, portfolios that offer three times as much on the upside or the downside -- that's turning investing into a casino. I like the Vanguard Total Stock Market mutual fund, but if you want to buy the ETF version of it and hold it for a long, long time, up to forever, how could I argue against that? The trouble is, when you buy something for the short term, or something that's concentrated as distinct from something diversified, that's really speculating, which is a loser's game. Besides the lousy stock and bond yields, how else has investing changed over your 60-year career? We've moved from the wisdom of long-term investing to the folly of short-term speculation. When I wrote my senior thesis in college, turnover in the stock exchange [a measure of how frequently shares are traded] was about 20% a year, and now it's so high there's not really any point in counting it. Mutual funds had a redemption rate of 8%, meaning investors had a holding period of 12 years. Now it's a three-year holding period. And we have this appalling thing where 40% of the mutual funds that were in business 10 years ago are gone. How the heck can you capitalize on the wisdom of long-term investing when the odds are almost one out of two your fund won't be here at the end of the decade? But can investors afford to just buy and hold their investments? Sometimes certain sectors, or the whole market, can seem wildly overvalued. Let's just think about the stock market for a moment. We're all buy-and-hold investors because collectively we all own the market. So, as a group, investors are buying and holding. The only question is: Can I out-trade the other guy? Am I really smarter than the guy I'm selling Microsoft to or planning to buy it from? Well, one of you is going to prove to be smarter. And I'd say that was a flip of the coin -- except for the cost of trading. And how many funds do you think someone needs in this buy-and-hold stock and bond portfolio? Well, the answer is so counterintuitive to the way people think. You can do it with one fund, a balanced fund that's 60% stocks and 40% bonds. Another simple strategy is a target-date fund, in which you get more bond exposure as you get older. But you don't need to put your money into eight different mutual funds. You didn't mention international funds. You don't need them, but if you think you do, invest up to 20% in international index funds. My reasoning: The S&P 500 is dominated by international companies. So you're already international. I think it's always the best bet that the U.S., foreign developed markets, and emerging markets will have the same return over the long run. Because markets aren't stupid. So if emerging markets have all this potential we read about, that's in today's price. You often cite a pretty conservative rule of thumb: Own your age in bonds, meaning 60% of your portfolio if you're 60 years old. Is that still true, given the low yields? It's a very rough guide just to start you thinking about the problem. When you retire, you start to rely on investment capital rather than your human capital. And you've got more wealth at stake and less time to recoup it, which means you're going to take these fluctuations more seriously. I think I can speak for other people in their antique years -- you get more nervous. The bond position means you're less sensitive to behavioral factors. It gives you an anchor to windward. Stock-picking pros aren't stupid. They're just expensive.